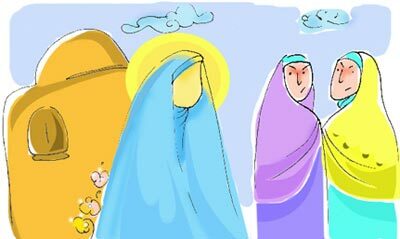 One day, when Khadije was talking to unborn baby, the prophet arrived home and asked her with whom she had been talking? Khadijeh explained the whole story. The prophet mentioned, “My race would be coming forth from the womb of this daughter. This doughter is the mother of great leaders in the future, and they are my best successors”. Hazrate Khadijeh, was ignored by the people of her tribe because of her marriage to prophet. So, when she got pregnant, the unborn baby in her womb, became her only friend in isolation and solitude. God helped Khadijeh in order to give birth to her daughter, she saw four women who entered the room, they were: Sara, Abraham"s wife, Assieh, Mozahem’s daughter [ and the Pharao’s wife ], Mary, Imran’s daughter, and finally Safoura, Joshua"s daughter… With the gracious help that they procured, she could deliver her baby safely into the world. The baby started to talking as soon as her entrance to the world.. She said:" I testify to the Mission of my holy father bestowed upon him by The Merciful God, My father is the Prophet of God, and he is the last Prophet, My husband is the patron of great men, and my two sons, are the heralds of our Religion…"
The Angels brought the joyous news of Fâtimah’s birth to Heavens, and because of her birth there appeared a brilliant light in the sky, and it lighted everywhere! Never had the Angels of Heavens seen such a beautiful and bright light in Heavens!